Taiwan has extensive water resources and a strong network of reservoirs, yet still faces water shortages. CommonWealth Magazine takes a look at the key reasons why, including problems lurking below the surface of the reservoirs themselves. Enough silt accumulates in Taiwan’s reservoirs every year to fill one Baihe Reservoir (in Tainan) and every 10 years to fill a Shihmen Reservoir (in Taoyuan). Because of that buildup, Taiwan is vulnerable to water shortages from the start of fall to the arrival of the Plum Rains in May and June, and they have become the new normal over the past 10 years. If the situation is not quickly addressed, the actual capacity of reservoirs for storing water will be down to half of their designed capacity by 2030 under the worst-case scenario, which would surely trigger the nightmare of rationing. 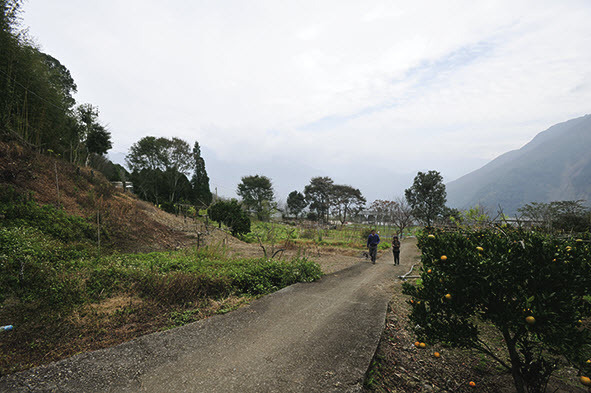 Guesthouses, peach orchards, and campgrounds, have created a scarred landscape on Lalashan, one of the main attractions of the Shihmen Reservoir catchment area. CommonWealth Magazine focused on Shihmen Reservoir to investigate why Taiwan can still be short of water when its reservoirs are full. Our team spent four months covering every inch of the reservoir’s surrounding water catchment area, pouring through domestic and global data on climate change, and marking every illegal site on a satellite map. A complex set of problems and realities have conspired to turn Taiwan into a water-starved island, detailed below. TSMC broke ground on a new NT$500 billion 5-nanometer wafer foundry in Tainan on Jan. 26, and it was the last ceremony hosted by Chairman Morris Chang, who will retire in June. Also there was Arthur Chuang, the senior director of TSMC’s 300mm Fabs Facility Division. As the person responsible for making sure the new facility has enough electricity and water, he is decidedly nervous, worried about whether there will be a stable supply of electricity, worried that the water recycling plant is 20 kilometers away, and worried about how the water pipeline will be laid out and whether it will be completed on schedule. Because of the lack of running water, half of the water to be used by the plant – the world’s most advanced wafer foundry – will be recycled from the wastewater from toilets and showers generated by residents of Tainan’s Anping and Yongkang districts. Without it, the foundry would not have a stable supply of water. The Ministry of Economic Affairs (MOEA) estimates that if new water resources are not developed, Taiwan will face a shortage of 350 million cubic meters of running water a year by 2031, equal to the total capacity of Shihmen Reservoir and Baoshan Second Reservoir in Hsinchu County. Taichung, Kaohsiung and Tainan would face serious shortages, and Hsinchu would start facing shortages. 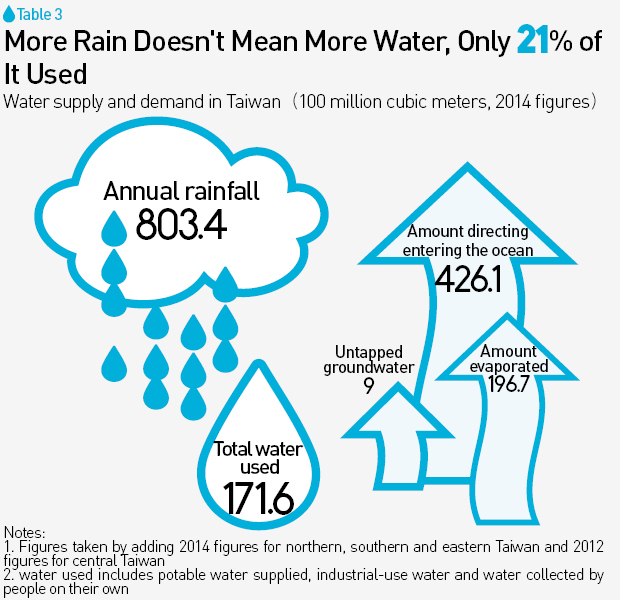 Though there is constant rain, “Taiwan is still a country that lacks water,” Chuang laments. Just as a deadly earthquake in central Taiwan on Sept. 21, 1999 disrupted supply chains, the lack of water has been an Achilles Heel that has left Taiwan vulnerable to attack by major competitor South Korea. 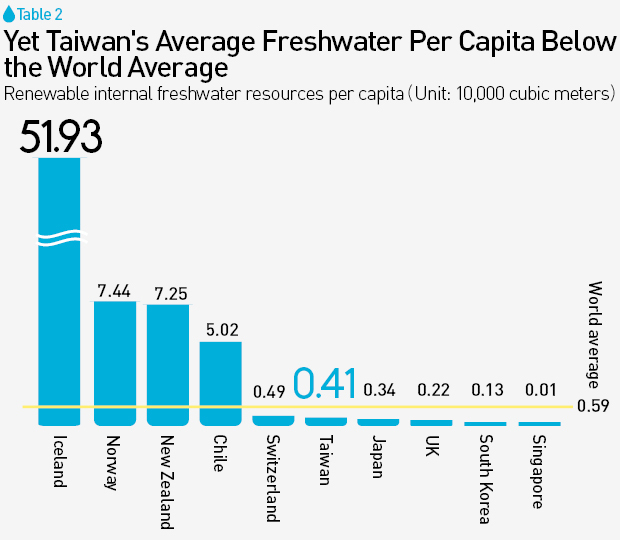 Just in this century alone, Taiwan has faced serious water threats in 2002, 2003, 2004, 2005, 2009, 2010, 2011, 2014 and 2015, so common in fact that they are seen as the new normal. So how big of an impact has this had on Taiwan’s semiconductor industry? “This is a normal measure taken in science parks. It’s not just us. Many factories are doing the same thing. TSMC has about 300 water trucks. Fortunately there have only been some close calls in recent years but nothing serious and we got through them,” Chuang says. The image of water trucks shuttling around local streets, however, has been exploited by South Korea in trying to get an edge on Taiwan. The Koreans argue that it proves Taiwan lacks water, calling into question the stability and reliability of its manufacturing sector. In fact, “the method used to solve water shortages every time is to get farmers, whose production value is relatively low, to suspend their spring cultivation,” says You Jiing-yun, an associate professor in the Hydraulic Engineering Division of National Taiwan University’s Civil Engineering Department. Sacrificing the interests of farmers is not a viable long-term option and can only result in social antagonism and rifts. If anything, Taiwan’s science parks are harder hit than any other interest group by the lack of water. According to a report on strategies to provide industry with a stable supply issued by the MOEA on Nov. 7, 2017, the consumption of industrial-use of water will grow in the future, with the pace of growth the fastest in science parks. A total of 403,000 cubic meters a day can currently be supplied to the Hsinchu, Central Taiwan, Central Taiwan Houli, Southern Taiwan, and Southern Taiwan (Luzhu) science parks, but their needs will increase to an estimated 813,000 cubic meters a day by 2031. A huge shortfall will result if new sources of water are not developed. Yet there’s a question nobody seems to be asking. Taiwan receives about 2,500 millimeters of rainfall annually, equal to about 80 billion to 90 billion cubic meters of water. Chiang Ming-lang, director of the Northern Region Water Resources Office of the Water Resources Agency under the MOEA, calls water the only natural resource Taiwan doesn’t lack, something Ting Cheh-Shyh, who heads National Pingtung University of Science and Technology’s College of Engineering, finds unbelievable. “The heavens have blessed us with this much water, but we don’t use it properly and don’t know how to use it,” Ting says, describing the moniker “water-starved island” as an embarrassment. Part of the problem is extreme weather, with Taiwan ever more noticeably teetering between more extreme droughts and floods. Rainfall data from the National Science and Technology Center for Disaster Reduction and the Water Resources Agency clearly reflects this new reality. Before 2000, Taiwan faced only two to four typhoons per decade that brought extreme rainfall, but there have been 11 in the years since. The most recent was in August 2015, when Typhoon Soudelor forced the Shihmen Reservoir to release 210 million cubic meters of water, about a full reservoir of water. 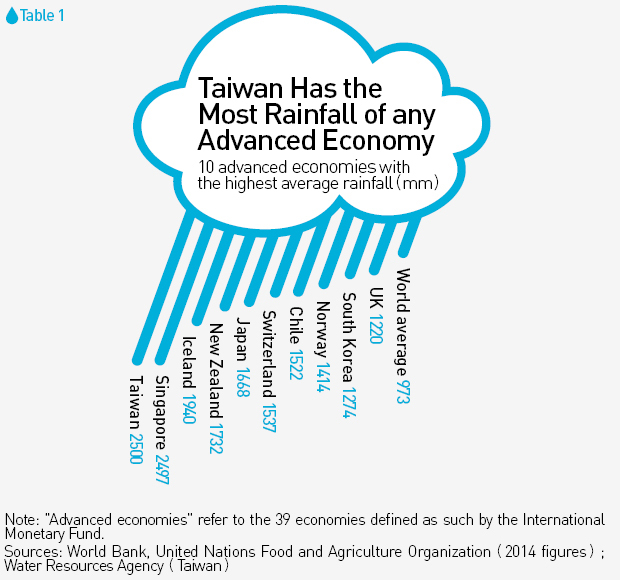 What was unusual is that the torrential rains came just months after Taiwan had experienced its worst drought in 67 years in the first half of the year. According to data from the central government’s National Sustainable Development Network, the country’s effective water storage capacity began plummeting after 2004, leaving dredging projects only able to keep up with the silt buildup under the best of conditions. What would happen if Taiwan’s reservoirs continue to accumulate silt? Development has triggered countless landslides, resulting in 70% of the more than 100 sand dams built in the Shihmen Reservoir catchment area already full of silt. In its 2017 report on climate change in Taiwan, the National Science and Technology Center for Disaster Reduction estimated that even excluding the impact of extreme weather, sediment will account for 48.6 percent of Shihmen Reservoir’s storage capacity and for 53.0 percent of Tsengwen Reservoir’s storage capacity by 2030. If extreme weather is factored in, those percentages rise to 62.0 percent for Shihmen Reservoir and 77.6 percent for Tsengwen Reservoir, turning the two facilities into massive repositories of silt rather than water. Still, reducing human environmental destruction could save Taiwan’s reservoirs. The National Science and Technology Center for Disaster Reduction’s climate change report also estimated that silt will only account for 7.8 percent of Feitsui Reservoir’s capacity under normal conditions by 2030. That would only increase to 10.1 percent of its capacity with extreme weather, indicating that this well protected reservoir is much better able to withstand extreme weather than other reservoirs in Taiwan. Once one of Asia’s engineering miracles and Shihmen Reservoir’s first large-scale sand dam, the Baling Dam was not able to withstand 10 million metric tons of sediment and collapsed 30 years after being built. Sadly, despite the consequences of destructive practices, they continue to proceed with impunity. Most people may see Shihmen Reservoir as nothing more than the lake seen at the top of the dam. To fully appreciate the reservoir and its current plight, however, one has to follow the Dahan River (which feeds the reservoir) upstream past the mountain resort areas of Jiaobaoshan, Dongyanshan and Lalashan. 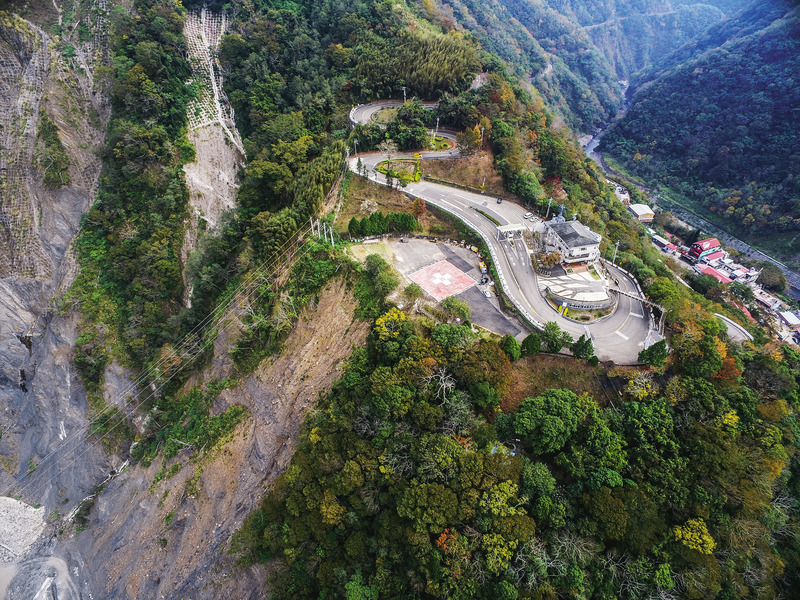 The Lalashan Visitor Center’s perch on top of a hill and its helipad could soon be threatened by soil erosion and landslides. Yet local residents and their elected representatives want to continue developing the area, damaging the land even more. Shihmen Reservoir is completely dependent for its water on this water catchment area, and if the soil collapses or suffers erosion, the debris will ultimately flow into the reservoir. Northern Region Water Resources Office chief Chiang, who is responsible for managing Shihmen Reservoir, says the silt that plagues Taiwan’s reservoirs is linked to development in catchment areas. Most of the silt buildup stems from natural factors, he says, but human factors still play a significant role. “What we can do is control the impact of humans,” Chiang says. But that’s easier said than done. Chiang’s water management agency carries insufficient weight to control local governments or keep elected representatives in check. Since Chiang’s agency first set up a group of volunteers to patrol Shihmen Reservoir in 2012, the six teams that have been formed have reported 690 cases of suspected illegal activity, but only 23 were judged to have violated the law and incurred penalties. The other cases were dealt with by offering guidance on making improvements to address the problems. Those outcomes reflect the many layers of bureaucracy involved and the adversarial relationship between local interests, votes and the protection of water resources. Ultimately, government policies supportive of development have opened the door to soil and water damage, exposing promises to strengthen management of natural resources as empty rhetoric. When one thinks of the local specialties the Shihmen Reservoir area is known for, freshwater fish tops the list, but Lalashan peaches are not far behind, having emerged as the national peach brand. Less well known is the high cost to the environment of cultivating those peaches. “Lalashan is all peach trees in front and an even bigger expanse of forest in back. The way it works is they cut down a tree today and plant a peach tree, then cut down another tree tomorrow and plant another peach tree, and very quickly a sizable swath of forest disappears,” says Lin Jiun-chuan, a professor in National Taiwan University’s Department of Geography who has traveled around Taiwan’s forests. “After that, they build an agricultural road and then gradually look to upgrade, because if they want to survive they need an agricultural road or an industrial road. Those are all things that elected representatives insist be done. Then it’s another upgrade to a county road, with government agencies powerless to stop the tide. The more roads built, the more serious the destruction,” Lin says. But how does cutting down forests and building roads threaten reservoirs? Simply put, they speed up the reservoir’s death. “Collapses can occur naturally, but they won’t happen that quickly or on that big of a scale. Retired NTU civil engineering professor Hung Ju-jiang once conducted a study on the impact of deforestation and road building on landslides, and found they increased the number of landslides 10-fold and the area of such disasters 100-fold,” Lin says. A close look in the direction of Lalashan from the Baling Bridge clearly proves Lin’s point – huge chunks of mountainside have crumbled into the Dahan River. Prior to 2015, the Lalashan Visitor Center was surrounded by a helipad, a small house, a camping area and a parking lot. All that’s left today is the helipad perilously suspended on the edge of an unstable cliff. Any more landslides and even the visitor center itself could plunge into the Dahan River below. Walk down the road from the visitor center, and head toward the Baling Bridge and on to the Dahan River Valley, and an even more shocking picture appears. 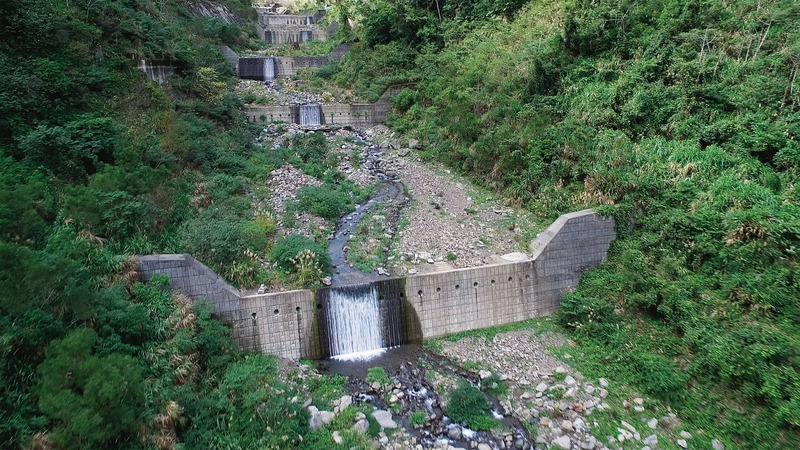 In 2007, Typhoon Wipha washed away the Baling Dam, leaving behind a broken wall. Sediment built up in the Baling Dam all flowed downstream toward the Ronghua Dam, turning that structure into a sand dam while barely maintaining enough water flow to operate the Ronghua Power Plant. Twenty million metric tons of silt have temporarily accumulated at Ronghua Dam, with Shihmen Reservoir the next stop. Keeping sand dams from accumulating silt represents a major challenge for the reservoir. Prior to 2005, more than 100 sand dams were built in the Shihmen Reservoir catchment area, and 70 are now full. Another 264 have been installed since then, with 68 now full. In other words, huge amounts of sand and rock have been blocked upstream, but how long that will last is anybody’s guess. Could those sand dams collapse? Opinion is split in the academic community, with the controversy showing no signs of subsiding. But the number of people who steadily contribute to the silt buildup in sand dams continues to grow, including urbanites who enjoy camping. When CommonWealth Magazine reporters went into the mountains upstream from Shihmen Reservoir, an official with the Northern Region Water Resources Office privately revealed his inner fears. “What worries me the most right now is indigenous peoples constantly clearing land and then selling or renting it to people from the outside, leading to many ginger fields and campsites popping up in the Shihmen Reservoir catchment area,” the official said. If you want to know how terrifying landslides or silt buildup in Shihmen Reservoir’s catchment area could be, just go see Xiuluan Village in Hsinchu County’s Jianshi Township. The whole area turns red in autumn as maple tree leaves change color, and it is recognized as one of Taiwan’s most beautiful sites. It was also one of the locations where the film “Seediq Bale” was filmed. Today, however, the mountainside is highly vulnerable to collapse, and 2 million tons of earth could come crashing down at any time, posing a huge threat to the village. “Every time there’s heavy rainfall, I worry this place might turn into another Xiaolin Village,” says Wang Chin-lun, the deputy chief of the Soil and Water Conservation Bureau under the Council of Agriculture, referring to the village in which hundreds of people were buried alive by a landslide precipitated by Typhoon Morakot. In compiling data from RVCamp.org’s campsite databank, CommonWealth Magazine found that more than 100 campgrounds have been built in the Shihmen Reservoir catchment area, many of them located in aboriginal villages. But not one was listed by Taiwan’s Tourism Bureau as a legal campground. “Growing cabbage and peaches are the most important source of income for local Aborigines. Outside of that, the majority of Aborigines do not have opportunities to make money,” says Xiuluan village officer Napo Dali, a member of the Atayal people, in explaining why land has turned into a commodity. In recent years, Napo Dali has seen many contractors from low-lying areas coming to Jianshi Township to rent land to plant ginger because of how well sloped land drains. It has reached the point of abuse, with even land with slopes exceeding 28 degrees also used to grow the crop. “If torrential rains occur, all of that land will slide and create a disaster. That’s why Aborigines don’t cultivate this kind of crop – it undermines soil and water conservation,” Napo Dali says. Behind that phenomenon is an unspoken secret in the Shihmen Reservoir catchment area – that renting land is the same as buying it. “Money talks. All the land that is being cleared to grow ginger has been ‘rented’ from aboriginal groups. But they have all signed contracts under the table, with the i’s dotted and t’s crossed, so the seller can no longer make use of the land,” Napo Dali says. The law in Taiwan stipulates that aboriginal lands cannot be sold to people who are not aboriginals. But an official with the Land Administration Department of the Council of Indigenous Peoples (CIP) said it is a regulation that the council cannot enforce. “The CIP’s job is to return land improperly taken from Aborigines by the Japanese or Nationalist governments to the Aborigines. After the land has been recovered, then it’s the private property of Aborigines, and if they want to rent it or use it as collateral, that’s up to the landowners. The Council has no way to regulate that,” says CIP Land Administration Department section chief Liao Yi-chun. Taking a trip to campgrounds around Shihmen Reservoir reveals how serious the problem is. 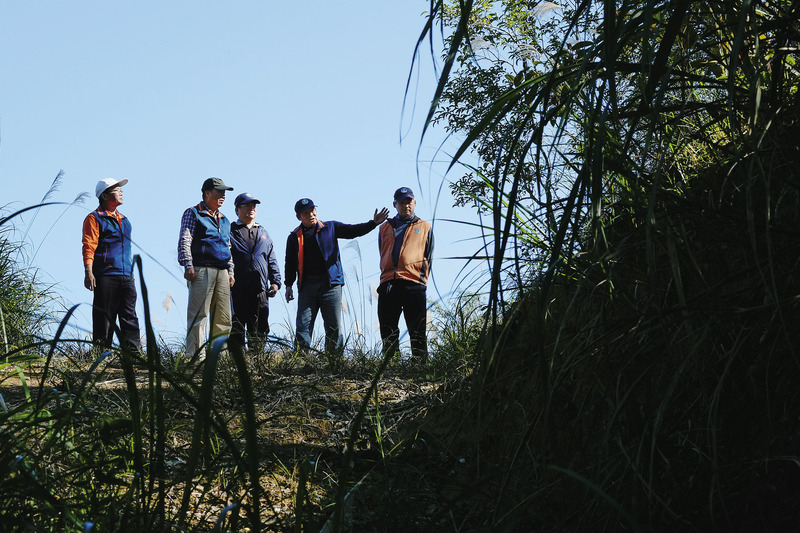 The secretary of the Shihmen Reservoir Volunteer Patrol, Hsu Wen-hsiung, and the head of the patrol’s Zhongli branch, Hu Yi-ren, took CommonWealth reporters around and showed them two illegal campgrounds. One was the “Mountain King Leisure Farm” (山大王休閒農莊), the other “Colin’s Alexander Campground” (Colinの亞力山大露營區). “Containers are used as shelters, and everything the campers eat, drink and egest is discharged toward Shihmen Reservoir, polluting our water source,” Hu says. These campgrounds should be illegal, but Hsu says the law has not deterred the practice, including at the Mountain King Leisure Farm. “We reported the situation. 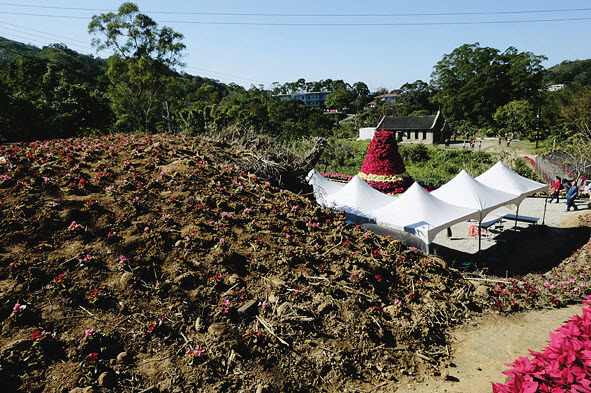 The Taoyuan municipal government deemed the behavior illegal, and it issued a fine of NT$60,000, but the campground continued to operate on weekends and holidays. The fine was kind of like paying ‘protection money’ to the local government,” Hu said of the Mountain King operation. 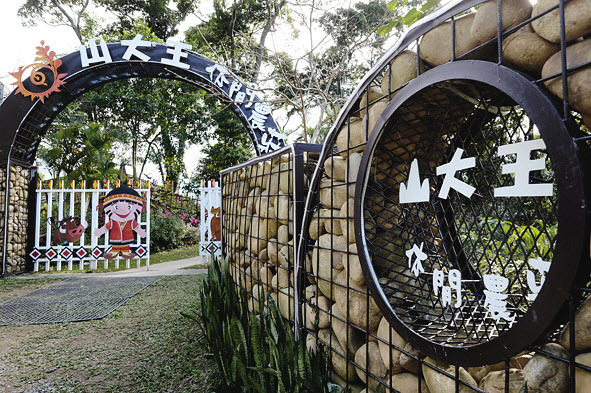 But the Alexander campground, which boasts of being run by an Australian, was even worse because it was an even a larger-scale camp built in the aboriginal Qwilan Village in Taoyuan’s Fuxing District. Because of that, its case was handed over to prosecutors after being reported to authorities, Hsu says. “This is a new approach that gets to the root of the problem – prosecuting Aborigines for illegally selling their land or prosecuting illegal practices that ravage soil and water resources,” says Soil and Water Conservation Bureau deputy chief Wang. The destructive campground practices and illegal development have scholars seeing camping areas as new culprits in the collapse of catchment areas. “Almost none of these campgrounds have undergone reviews of soil and water conservation plans, so excavating slopes will lead to soil erosion and even bigger landslides,” argues NTU’s You. 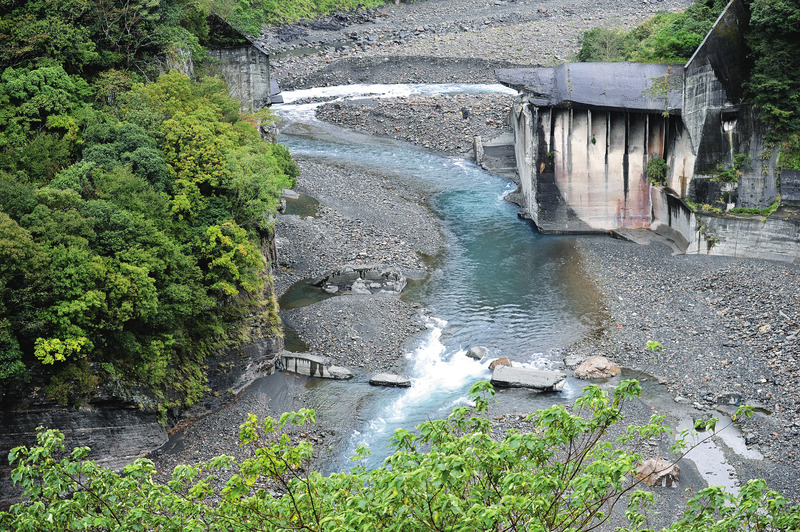 Taiwan remains highly dependent on its reservoirs for water, and therefore highly dependent on funding to maintain reservoirs and combat the problem of sedimentation. “Clearing a cubic meter of silt costs an average of NT$500, so 100 million cubic meters of silt costs about NT$50 billion to get rid of. It would probably be cheaper to just build a new reservoir,” Northern Region Water Resources Office chief Chiang says. The director of the Southern Region Water Resources Office, Huang Shih-wei, says a new approach is being used to deal with Tsengwen Reservoir’s silt problem. “We are using a homegrown ‘elephant-trunk piping’ project unique in the world. The elephant trunk-shaped pipe stuck into the reservoir bed serves as an outlet for high-density silt,” Huang says. According to Huang, that pipe is connected to a desilting tunnel that is created by digging out an opening in a nearby hillside. “The desilting tunnel extends to the downstream opening of the Tsengwen River aqueduct tunnel pipe. It relies on surges of water delivered by typhoons to drain the silt. The whole project cost about NT$4 billion,” Huang says. Earnings from guesthouses and peaches go to private interests, but the cost of desilting comes out of everybody’s pockets. 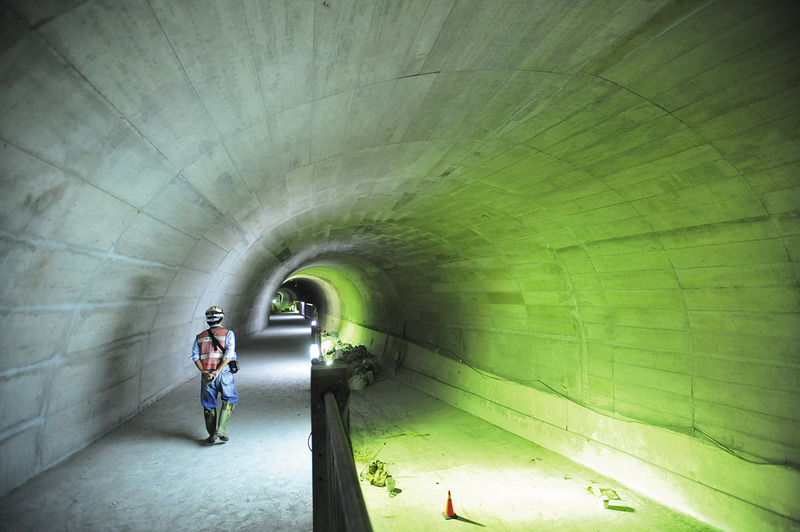 The Tsengwen Reservoir desilting tunnel project, which included carving a tunnel through a mountainside, cost NT$4 billion. The water resources plan included in the government’s “Forward-looking Infrastructure Development Program” also includes the construction of the Amuping desilting tunnel at Shihmen Reservoir at an estimated cost of NT$4.6 billion. In rainy seasons, heavy rains will force the discharge of silt, while in dry season gravel trucks can be driven through to pump out silt and transport it away. There was also a NT$25 billion budget for rehabilitating the reservoir, much or all of which has been spent. In other words, besides building up silt, this big reservoir has also accumulated of bill of NT$30 billion to clean it up. The cruel reality is that even if these projects reach their most optimistic goals and clean the Shihmen and Tsengwen reservoirs of whatever silt comes in, there is no way to excavate the silt built up on the bottom of those reservoirs. It is also impossible to guarantee that all of the sediment can be cleared away if another typhoon arrives on the scale of Typhoon Morakot, which devastated southern Taiwan and deposited huge amounts of debris in southern reservoirs. Going back to the main source of Taipei’s water, Feitsui Reservoir, it had accumulated 26 million cubic meters of silt as of the end of 2017, accounting for only 6.47 percent of the reservoir’s designed capacity. The average sedimentation has been far lower than anticipated. Thomas Chan, the deputy chief of the Environmental Protection Administration, believes the surprisingly slow silt buildup could extend Feitsui Reservoir’s life 100 years beyond what was originally expected. Though the catchment areas of Shihmen and Feitsui reservoirs are on opposite sides of the same mountain range, their sedimentation rates are worlds apart. NTU’s You attributes that to Feitsui Reservoir being designated as a special Taipei water management area, where development is strictly prohibited. Soil and Water Conservation Bureau deputy chief Wang agrees, explaining that a single Taipei Water Management Office manages Feitsui Reservoir under a unified system. In effect, only one agency manages every drop of water, from when it is collected in a forest to when it flows into the reservoir. Shihmen Reservoir, on the other hand, falls under the jurisdiction of the Forestry Bureau, Council of Indigenous Peoples, Soil and Water Conservation Bureau, Ministry of the Interior, Environmental Protection Administration, local governments and the Water Resources Agency. The abundance of agencies leads to bureaucratic inefficiency and a lack of water for the public to drink.. Without Shihmen Reservoir, water for drinking and agricultural and industrial use in the Taoyuan area would be cut off, as well as the 200,000 cubic meters of water the reservoir supplies the Hsinchu area every day, which could affect the vitally important Hsinchu Science Park. Taiwan’s reservoirs may appear to be full of water, but the country suffers from a serious lack of water. Perhaps it’s time to rethink the problem and realize that the clearing of silt and conservation of catchment areas are simply management measures. Instead, Taiwan should begin to consider the problem from the moment when a drop of water falls from the sky and ensure that every drop reaches forests, green spaces, riverbeds, reservoirs and oceans and becomes a valuable resource rather than be turned into a cause of collapses and landslide disasters. 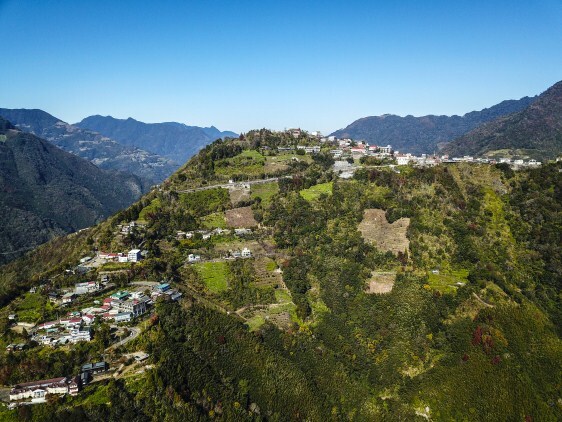 It has come time for people in Taiwan to realize that taking a bite out of a sweet and juicy mountain peach or camping close to nature near Shihmen Reservoir comes at a high cost – less potable water available for everyone to use. 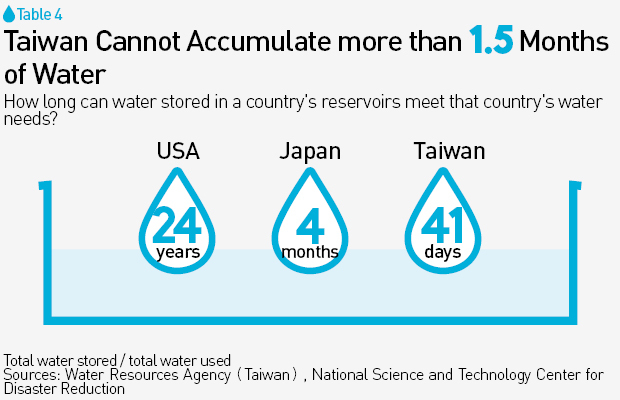 ♦ Underground Reservoirs: One Solution for Water-starved Taiwan? Next One Solution for Water-starved Taiwan?